Visiting Downtown Disney is FREE of charge. Parking is also free but it is very busy. The area known now as downtown disney evolved since the early 1990�s into the entertainment complex that now accommodates over one hundred shops, restaurants, and theaters. Downtown Disney may be divided into three separate sections: Marketplace, Pleasure Island, and West Side. 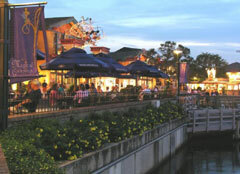 The Marketplace (formerly known as Disney Village) is the original section of what is now Downtown Disney. A great place to take the kids, The Marketplace is home to the LEGO Imagination Center, where kids can play with one of the largest collections of Lego pieces around. World of Disney, Once Upon A Toy, Ghirardelli Soda Fountain & Chocolate Shop, Fulton's Crab House, Rainforest Cafe, Cap'n Jack's Marina offering boat rentals, and other stores and restaurants. Pleasure Island, with eight nightclubs including a 1930's Explorer's Club themed Adventurer's Club, The Comedy Warehouse, 8TRAX featuring 70's & 80's music and Mannequins Dance Palace, featuring a revolving dance floor and trance/dance/techno music. West Side, with a Virgin Megastore, an AMC 24-screen movie theater, Cirque du Soleil - La Nouba, the House of Blues restaurant and show auditorium, the five floor DisneyQuest "indoor theme park", Planet Hollywood, the Wolfgang Puck Caf�, Bongos Cuban Caf�, and other various shops and eateries.